Boyle Heights Historical Society Advisory Board member Rudy Martinez continues his series of posts on early Boyle Heights history, including its ethnic and racial diversity, with this remarkable multi-part post on the "Russian colony" of the Flats area of the community. Check back weekly for further installments and enjoy! Angry at the indifference to the injustice committed against them and the refusal by a new growing power in their midst to make amends, the angry crowd of about a hundred began to storm the gates, shouting their demands. Some reportedly began throwing stones at the armed security force summoned to subdue the “angry mob” of mostly bearded Russian men. Tension and agitation had been openly simmering between two opposing forces throughout the city for some time, but on this day, the violation was too flagrant to ignore. 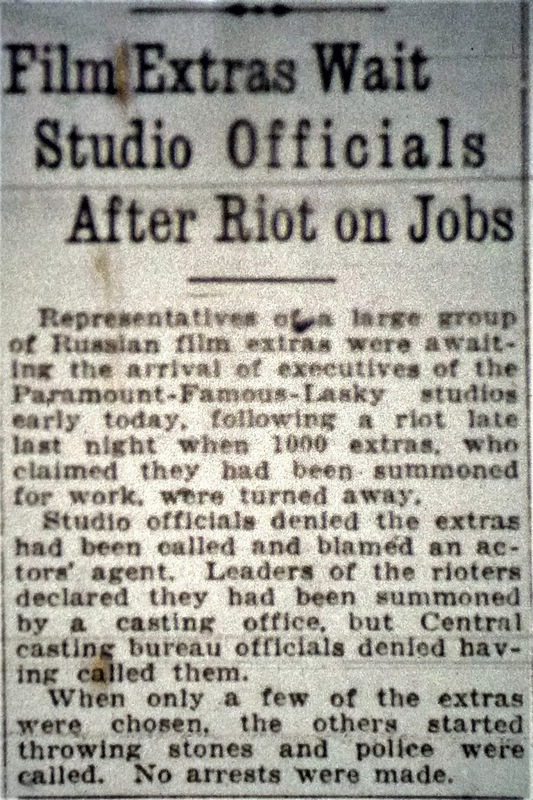 An article on the "Russian Revolt" from Variety, 28 March 1928. 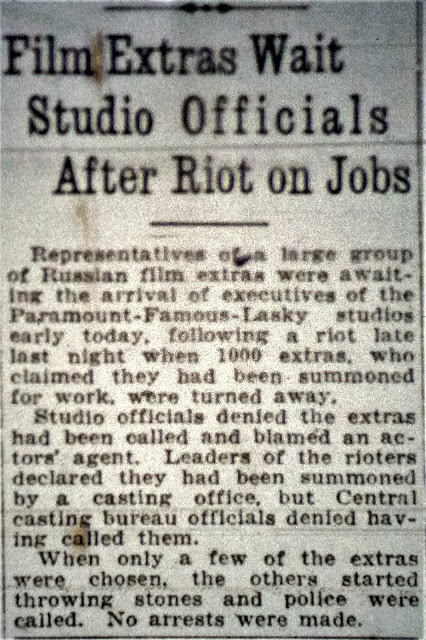 This skirmish occurred in 1928 and the crowd of protesting Russians were actually compensation-demanding movie extras who had gathered outside the now-iconic arched gateway entrance to Paramount Studios in Hollywood – one of the largest and most successful movie studios in the world. The “gate-crashers” were Russian immigrants who lived in a section of Boyle Heights known as the “Russian Flats.” This unscripted expression of labor unrest occurred during a period when Los Angeles civic and business leaders boasted that the local economy produced plenty of jobs and newly built homes, all surrounded by picturesque citrus groves. However, city leaders also supported housing segregation based on race and ethnicity while enthusiastically promoting Los Angeles as the capital of open shop, or non-union labor. For several decades beginning in the 1920s, the historic and long-gone Russian Flats district in Boyle Heights was home to the largest immigrant “Russian colony” in the United States. Much less widely-known today is that, while the fledgling local movie industry was well-established as an entertainment and economic juggernaut, filmmakers and this unique, vibrant eastside community interacted several times during Hollywood’s silent era in interesting ways, to say the least. The incident described above will be revisited with a little more detail later in this multi-part post, but let’s start with a brief overview of the Russian immigrants in the Flats in Boyle Heights, and some of the early connections between Hollywood and this little-known community. The first wave of Russian immigrants and the first pioneering filmmakers arrived in Los Angeles only a few years apart at the beginning of the twentieth century. In 1907, the Chicago-based Selig Polyscope Company came to Los Angeles to film the final scenes of The Count of Monte Cristo on a crudely built outdoor set in downtown Los Angeles and at the shoreline in Santa Monica. Though the film camera had been introduced to Los Angeles as early as 1897 when a few operators occasionally shot some documentary-type shorts, this 1907 production would be the first time an actual motion picture company shot scenes in Los Angeles. Seeking to escape the almost monopolistic hold that inventor Thomas Edison had on the emerging camera/film technology patents (and the licensing fees he demanded) other eastern-based film outfits would soon relocate to the west coast as they also discovered that year-round filming was easier with Southern California’s mild climate, varied geography, and relatively weak labor unions. 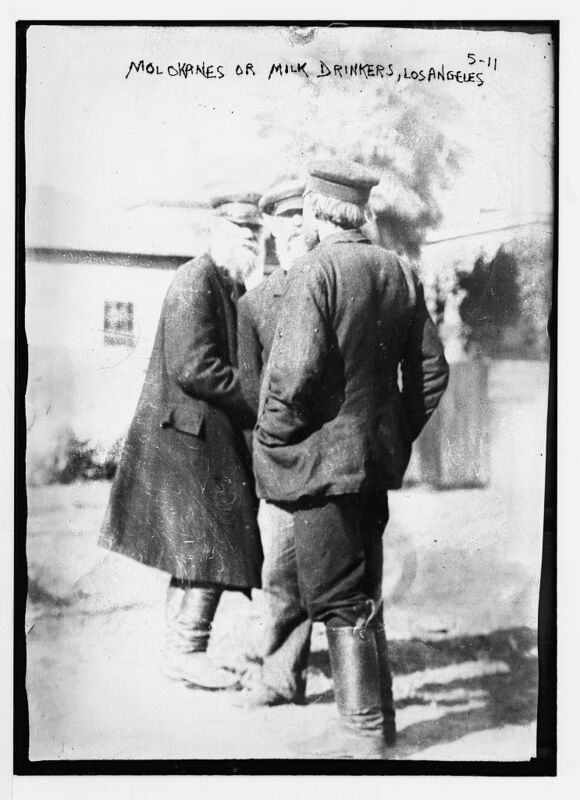 A Bain News Service photo from the Library of Congress showing Russian "Molokanes or Milk Drinkers" in Los Angeles, undated. The new immigrants were members of a close-knit sect of the Russian Orthodox Church known as the Brotherhood of Spiritual Christians. Sometimes called Holy Jumpers because of their reportedly frenetic exuberance during religious services, (initially causing neighbors to protest to the local ward council about the unsettling “loud noise”), today they are commonly known as Molokans, which means “milk drinkers” because of their refusal to abstain from dairy during Orthodox fast days. Steadfast pacifists, many fled Russia after 1900 to escape compulsory service during the Russo-Japanese War and during the early stirrings of revolution against the autocratic regime of Russian Tsar Nicolas II. The first area of settlement by the Molokan Russians along the west bank of the Los Angeles River near today's Union Station, with boundary lines and landmarks superimposed on a 1909 map of the city. At their highest period of immigration between 1904 and 1912, almost four-thousand Russian Molokans immigrated to the United States, via Canada, with a majority moving to Los Angles. Florida industrialist and sympathetic Russian immigrant, Pytor Alexeyevitch Dementyev, better known as Peter Demens, a “founding father” of the Florida city of St. Petersburg, underwrote many of the early expenses for the California-bound Russian Molokans. (Demens passed away in 1919 in Alta Loma, California where the historic Demens-Tolstoy home still stands today). The earliest Russian Molokans to arrive settled in the immigrant-crowded industrial section of Los Angeles in the area around Aliso and Vignes Streets near today’s Union Station. Located along the western edge of the still-unpaved Los Angeles River, this site was surrounded by rail yards, gas tanks, and the prostitution or “crib district” on Alameda Street. Initially sleeping in horse stables and cooking outside, they eventually met Congregationalist minister Dana Bartlett, a devoted social reformer and “a friend of the immigrant poor.” Bartlett also provided the Russian immigrants with free lodging, meals, schooling, and accommodations to hold religious services at the nearby Bethlehem Institutional Church Settlement and the Stimson-Lafayette Industrial School. A pair of photographs of Molokan Russians in the Flats area of Boyle Heights, from the New York Public Library Digital Collection. By 1907, most of the Russian Molokans started to relocate over to the floodplain area of Boyle Heights – the Flats – on the east side of the river. A few moved further east to the small hillside enclave of crude shack housing known as “Fickett Hollow,” centered at 7th and Fickett Streets. In addition, after a brief stay in Boyle Heights, a small contingent immigrated to Baja California’s Guadalupe Valley in 1906, establishing an agricultural colony that lasted until the mid-1960s. We hope you've enjoyed the first part and come back next week for the second installment in the series! Great job Rudy! The area of Boyle Heights has changed since those days. Currently, it is going through some gentrification. I worked as a stop-motion animator in the late 1980s in a warehouse on S Boyle Ave, just up from the Sears building. At that time, Boyle Heights offered low rent for the amount of space we needed to have several sets going at once, for ABC after school specials - and our crew of 8 very much enjoyed the culture and history of Boyle Heights, and felt ourselves to be part of the flux of people and industries that have come and gone. Love hearing that BH has a real link, much earlier, to the film industry. Looking forward to reading the rest. Hello smallgreenberd, sorry for not responding earlier, but thanks for the comment and recollections. There'll be a talk about the star of the first Chinese-American film made in the U.S., here in Boyle Heights, at the Homestead Museum in City of Industry on 22 March. You can get more info at www.homesteadmuseum.org. Hello, Rudy! What is the best way to contact you?